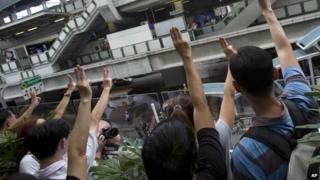 People protesting against a military coup in Thailand have started using a three-fingered salute that recalls a gesture of defiance seen in the popular film Hunger Games, it appears. The sign, in which the middle three fingers are held up, was used as an expression of silent protest against a fictional authoritarian state called Panem in Catching Fire, the second film in the Hunger Games trilogy. One person, Manik Sethisuwan, tweeted: "Dear #HungerGames. We've taken your sign as our own. Our struggle is non-fiction. Thanks." There are other theories circulating about the gesture's origins. News website Khaosod tweets that the three fingers stand for liberty, equality and fraternity - the French revolutionary slogan. But the gesture is catching on, and has apparently become so widespread that Thailand's coup leaders are investigating whether to arrest people over it, the Bangkok Post newspaper reports. It seems at least one person may have been detained on Sunday for allegedly making the gesture. Meanwhile, demonstrators are having to be creative about getting around an army ban on gatherings of more than five people. On Saturday, some protesters staged a "read-in" rally - in which groups of four stand reading books. On Sunday, a flash protest appeared at a shopping centre in Bangkok as activists tried to skirt security forces around the city. Thailand's generals took charge on 22 May, saying they had to restore stability after months of protests against former Prime Minister Thaksin Shinawatra and the government led by his sister, Yingluck Shinawatra.